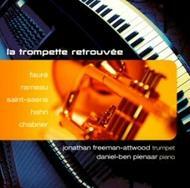 Jonathan Freeman-Attwood is “a multi-talented trumpeter, academic and Renaissance Man” (BBC Music Magazine). 'La Trompette Retrouvée' is Freeman-Attwood’s second recording in his series with Linn Records and continues to explore his passion for expanding the limited chamber repertoire for trumpet by imaginatively arranging chamber works previously scored for alternative forces. He is joined on this recording by the pianist Daniel-Ben Pienaar. As the title implies, this new CD contains works by French composers, transforming works originally for forces such as cello, piano and orchestra into convincing transcriptions for trumpet and piano. Freeman-Attwood allows the insistent demands of the originals to assert their primacy and dictate the nature of each transcription, producing music which pays homage to the legacy of the composer’s intentions but also adds a fresh sound and spirit. As a trumpet player, Jonathan Freeman-Attwood has performed and recorded both as a soloist and as a member of various ensembles, most notably as an exponent of the piccolo trumpet. With John Wallace, in 2004, he released a disc of works by Rheinberger, Strauss and Elgar entitled “The Trumpets that Time Forgot” (Linn CKD 242), heralding a series of discs exploring ways in which the trumpet can, retrospectively, be ‘written into’ established traditions of mainstream solo and chamber music. South African born Daniel-Ben Pienaar is an award-winning pianist whose live performances and recordings (with Victor Japan) have won him widespread acclaim: “He offers answers that push the music to the brink though the bounds of credibility aren't breached. His is a tough but thought-provoking approach” (Gramophone).